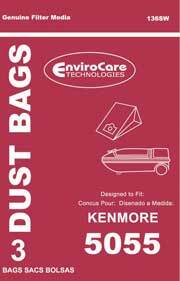 The original Panasonic bag offered for the models listed below was discontinued by the manufacturer, however, this bag manufactured for Kenmore fits all the Panasonic models listed below perfectly. This Panasonic/Kenmore Canister Vacuum Cleaner Bag Type C5 (3 Pack) will be delivered in the United States in 3 to 6 days! In the chart below, you'll find some of the Panasonic models that this Canister Vacuum Cleaner Bag Type C5 (3 Pack) fits. To view all parts and/or accessories for your machine, find your model number and click the link! If you don't see your model below and you're not sure if this is the correct Canister Vacuum Cleaner Bag Type C5 (3 Pack) for your machine, click here for a list of all Panasonic models for which we offer parts.